Onside Independent Advocacy is a Worcester-based charity that focuses on the needs of vulnerable individuals throughout Herefordshire and Worcestershire. They help to ensure that their voices are heard, their rights are adhered to, help them gain new skills and to assist with integration with their communities. 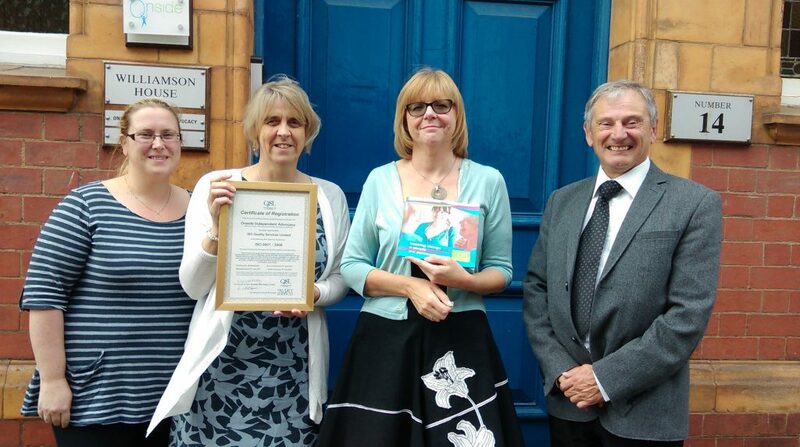 Despite being a successful charity in the heart of Worcestershire and making a difference “to the lives of approximately 3000 individuals a year”, Onside Advocacy decided to implement the ISO 9001 Quality Management Standard to “help strengthen and organise their internal systems and processes”. They stated it was important to them to have a ‘recognisable and respected’ quality trade mark in place to boost their future tenders and meet customer expectation. Onside Advocacy noted that through the ISO 9001 System they can “provide the service that their customers, stakeholders and service users require”. During the implementation of ISO 9001, Onside Advocacy found the process to be especially straightforward. Despite saying that it was challenging to continually monitor, they claimed that the process itself was very smooth, and there wasn’t a huge amount of adjustment required. A way in which they adapted their way of working is to change the format of their quality team meetings. They now utilise the time in the meetings to achieve outcomes rather than giving individuals tasks to complete outside of the meeting. As a company, we don’t not want to simple satisfy our customers but go above and beyond their expectations; delivering fast and effective services for a stress-free future. We strive to create long-lasting and trusting relationships between ourselves and our clients and are always looking forward to creating new ones. Rosie, Operations Manager at Onside Independent Advocacy would advise anyone starting the ISO process to “focus on specific areas or on key policies and procedures” and to break it down into manageable chunks to help you prioritise. For more information regarding the ISO 9001 Quality Management System please click here.